Ì know the general idea of using a guide coat to find your highs and lows on a panel. Im new to autobody and confused on after you spray your guide coat. Im using the basic rattle can flat black. After spaying your guide coat (mist) and finding your low spot, the paint from the rattle can is still in your low spot. Do I sand it out and apply my body filler or can I apply my filler over top? The trick to making the surface level is to block sand on the high spots until the guide coat in the low spots is gone. You don't want to chase the guide coat into the low areas, just sand on the high area until you're down to the guide coat. If there isn't enough material on the high spots to sand off to level the area then scuff the low spot and add filler to bring up the low area. I will often use a guide coat on the fillers too, not just primer like I did years ago. In a perfect world, you would be able to have your filler so close to finished that when you block your primer you don't need to go back to filler again. There seems to be a certain instinct where people want to get panels in primer so you can see progress, I get that used to do it too. took me a lot of paint jobs to get over that urge & spend the time needed in the panel straightening filler stage, as uninspiring that can be at times. The nice thing about the guide coat products that are out there for this task, is they are ready to sand pretty much as soon as you put them on, won't plug your paper & will come back off with mild reducer if needed. Not as cheap as a $1.99 rattle can of flat back, but works much better. When we are blocking our filler we've found that dry guide coat works best. We can apply it several times on one application of filler but we use aerosol when we wet sand. The dry guidecoat is the bomb! OMG you start using that and you will never use an aerosol again. It shows you EVERYTHING, even 180 scratches, it's awesome. The aerosol is often too large of droplets and just gives you an idea, but not anywhere near the perfection the dry can give you. Yes you want to sand that out of there before you apply more filler. hmm, i've always used the spray. used to just use flat black, now the sem stuff. i might have to try the dry now. I am in the same boat and was thinking the exact same thing. 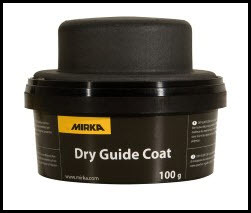 I also just saw that Mirka has a white powered dry coat. * Does the white actually work on the darker colors? How long would you say your dry powder guide coat would last you. Based on a 50 year old car that has very little body work. But has seen a few dents here and there. It lasts a pro working every single day for months! The spray "Guide coat" not a simple black paint, but the stuff that is called "Guide coat" has a pretty fine spray that is a little different than regular "spray paint" so it does work a lot better. But not even close to the powder. evercoat spray can guide coat.. I don't think I've ever masked to spray guide coat because I only use it on top of primer, so it's already masked. On filler I use dry guide coat so no masking is required there either. at this point all is umasked so i dont like that spray getting into blend zones..